The "bookend season" for the Baltimore Colts resulted in a 2-14 record. Wins in the first and last game against the New England Patriots by a total of three points were the only bright spots. In between, the Colts set six NFL records. Few observers were impressed by the Colts' win. No one knew at the time that the Patriots, like the Colts, were destined for a 2-14 season. But the Patriots had a reputation for failing to salt away weaker opponents. "The Patriots are considered by more than a few observers to be the collective head cases of the National Football League, finding one way after another to blow the 'gimmie' games," wrote one AP columnist. 1-14 met 2-13 for the right to select DE Kenneth Sims from the University of Texas. The Patriots were six point favorites on the road. Other than the 1976 first year Tampa Bay Buccaneers, the Baltimore Colts may have been the worst team in NFL history. New England committed four turnovers, including three interceptions by backup, Tom Owen. Baltimore QB Bert Jones was 17 for 28 for 267 yards and three touchdowns. The Colts offense had one decent game when they didn't need one. They finished 26th out of 28 NFL teams on offense, and 28th on defense. They were "out tanked" by the Patriots. Naturally, the Colts won the one game they probably should have lost, a sloppy 23-21 affair marked by numerous penalties and turnovers. The Colts offensive line played well, Dickey and McMillian had great games, and Glasgow recorded a drive-killing interception that appears to be the team's only clutch defensive play of the season. But the few fans who saw the game -- "Office Christmas parties would draw more people," Ken Denlinger quipped in the Washington Post about a crowd estimated in the 18,000 range -- probably weren't dazzled by heroics. They were bewildered by a Jones third-down scramble that ended when the quarterback went into his slide just after the down marker ... the wrong down marker, because Jones was still eight yards shy of a first down. "We had a helluva start and a helluva finish." 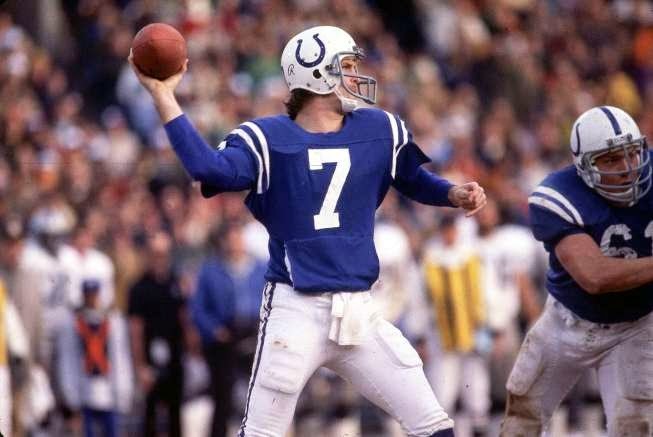 Following the 1981 season, the Colts traded QB Bert Jones to the Los Angeles Rams for the number four pick in the 1982 draft. Baltimore selected Art Schlicter from Ohio State. The Colts gave Schlichter a $350,000 signing bonus, much of which he wagered away before the league suspended him. "One for the ages," said Pagano, Indianapolis' coach. "I think somebody said that it was the second-largest comeback or whatever in the history of whatever. I guess 21 wasn't large enough at half, so we thought we'd give them another seven, you know, just to make it interesting." Indianapolis became only the second playoff team to rally from that big a deficit. Buffalo rallied from 32 points to beat Houston 41-38 in January 1993, though that one required overtime. If things weren't bad enough in the first half where the Chiefs led 31-10, they got worse for the Colts on the first play of the third quarter. Kansas City S Husain Abdullah intercepted Colts QB Andrew Luck at the Indianapolis 18 yard line. Three plays later, the Chiefs led 38-10. The Colts edged closer on a 10 yard TD run by RB Donald Brown, and a three yard TD pass from Luck to Brown making the score, 38-24. The Chiefs were unable to move the ball and punted. Colts QB Andrew Luck was intercepted again by S Husain Abdullah at the Indy 28. This led to a Kansas City field goal. 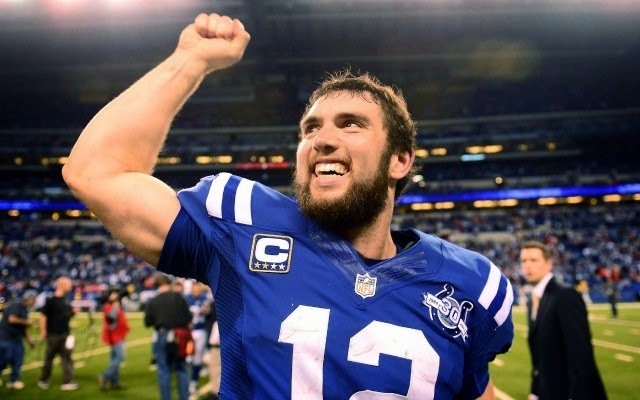 The Colts were able to cut the lead to 41-31, on an Andrew Luck 12 yard TD pass to TE Coby Fleener. Following a Kansas City punt, Indianapolis marched 90 yards in 12 plays. The drive was capped off when QB Andrew Luck recovered a Donald Brown fumble, and ran it in from the five yard line for the TD. The no huddle had worked brilliantly for the Colts, and they trailed, 41-38. The Chiefs would only need three minutes to tack on a 43 yard Ryan Succup field goal to increase the lead to 44-38. Indianapolis would need just four plays to take the lead. A 64 yard bomb to WR T.Y. Hilton from Andrew Luck tied the game, and K Adam Vinatieri converted the extra point for a 45-44 lead with four minutes 21 seconds to play. Kansas City drove from its own 20 yard line to the Indy 43. The Chiefs had a fourth and 11 pass from QB Alex Smith intended for WR Dwayne Bowe fall incomplete at the two minute warning. The Colts ran out the clock. In one of the highest scoring games in NFL playoff history, no points were scored in the final four minutes. The Colts would have possession for only 22 minutes 27 seconds, but they were able to hold the Chiefs to just a field goal in the fourth quarter for the miraculous comeback win. QB Andrew Luck kept both teams in the game with 29 for 45 passing for 443 yards, 4 TD's and three interceptions. Luck also carried seven times for 45 yards. This overshadowed the fine performance by Kansas City QB Alex Smith who completed 30 of 46 passes for 363 yards, 4 TD's, no interceptions and a QBR of 118.2. 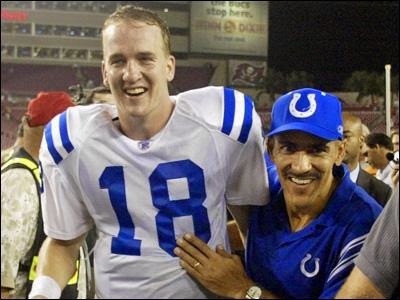 The game marked the return to Tampa for Colts head coach, Tony Dungy. Tampa Bay had the top ranked defense in the league, including six 2002 All-Pro selections. The reigning Super Bowl champs had just shut out the Philadelphia Eagles the week previous, 17-0. The Bucs acted like the '85 Bears. DT Warren Saap was used at TE against the Eagles, catching a 14 yard pass. Warren emphatically signaled for a first down. Philadelphia fans were insulted, but silenced by the Buccaneers. Tampa Bay opened a 21-0 first half lead. QB Brad Johnson tossed a 74 yard TD to WR Keenan McCardell. On the ensuing series, Colts S Mike Doss intercepted a pass from Brad Johnson. During the return, Doss fumbled and McCardell picked up the ball and raced 57 yards for a defensive TD. With just over four minutes to play in the fourth quarter, the Bucs led the Colts, 35-14. On the kickoff, Colts WR Brad Pyatt returned the ball 90 yards setting up a short score for Indianapolis. Following the TD, an onsides kick was recovered by the Colts leading to another score with two minutes 29 seconds remaining in the fourth quarter. A second onsides kick was unsuccessful, but an unsportsmanlike penalty on the Bucs would force the Bucs to punt. Indy QB Peyton Manning marched the Colts 85 yards in just five plays. A second unsportsmanlike penalty aided the drive. Tampa attempted a field goal from 62 yards at the end of regulation, but it was wide. The first half had ended on a missed field by Martin Gramatica from 60 yards. In overtime, the Bucs moved into Colts territory at the 41 yard line. On fourth and inches, they played it safe and punted. A 15 play drive got the Colts to the Tampa 22 for a 39 yard field goal. Colts K Mike Vanderjagt missed, but Bucs DE Simeon Rice was penalized for leaping. Vanderjagt's second attempt hit the right upright, but bounced through for the 38-35 final. Vanderjagt would finish the year, 37 for 37. New England had won seven of the past 10 meetings between the teams,including two wins in the RCA Dome in Indianapolis. This AFC title game was eerily similar to the 1977 regular season finale in Memorial Stadium. Each time, the Patriots had opened a 21-3 lead. Both times, the result was the same. In the 1977 AFC East, the Miami Dolphins, Baltimore Colts and New England Patriots were in a battle for the division crown. Under the playoff format, a three way tie would eliminate Baltimore. In Week 13 in the closing seconds, the Colts allowed a 2 yard punt block TD by Detroit Lions WR Leonard Thompson on P David Lee for an intentional, 13-10 loss. This loss eliminated the Dolphins, and the Colts beat the Patriots in Week 14 in a hotly contested battle, 30-24 for the division crown. There was no such thing as wildcard teams at that time, and New England would not forget this maneuver by the Colts. The game featured an interception TD return by the Patriots CB Assante Samuel, an 80 yard kickoff return by Ellis Hobbs and two successful fourth down attempts. OG Logan Mankins would also recover a Laurence Maroney fumble in the end zone for a TD. The Colts would get TD's from DT Dan Klecko on a one yard pass from QB Peyton Manning, and C Jeff Saturday on an end zone fumble recovery. The Colts took the lead 38-34 with one minute two seconds to play on a three yard run by Joseph Addai. The key moments in the seven play 80 yard drive were the roughing the passer penalty, and the fumble recovery in midair by WR Reggie Wayne following his catch from Peyton Manning. New England was able to move into Colts territory at the 40 yard line before QB Tom Brady's pass was intercepted by CB Marlin Jackson. This was the best win in Indianapolis history. "Sick and tired of being tired at the end" no longer rang true. The Baltimore Colts were 5 1/2 point favorites in the first nationally televised NFL Championship Game. 45 million people watched the contest. The blackout rule did not allow the game to be shown in New York City. The game has since become widely known as "The Greatest Game Ever Played". There were 10 players and coaches from the New York Giants who were inducted into the Pro Football Hall of Fame. Vince Lombardi was the Giants' Offensive Coordinator while Tom Landry was the Defensive Coordinator. Baltimore contributed seven players and coaches to the Hall of Fame, including head coach, Weeb Ewbank and QB John Unitas. John was voted the greatest player in the first 50 years of the NFL. 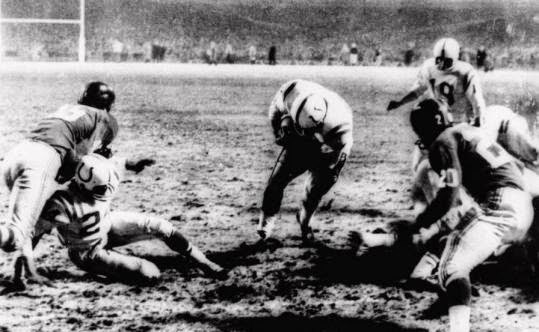 Two fumbles by Giants RB Frank Gifford deep in his own territory had given the Colts at 14-3 lead at halftime. New York replaced the ineffective starting QB Don Heinrich with Charlie Conerly(#42). Charlie led the Giants to two second half touchdowns, including a 15 yarder to Frank Gifford for the 17-14 lead. With two minutes to play in regulation, rather than go for the first down on fourth and inches from its 40 yard line, New York punted. Baltimore moved into field goal range after QB John Unitas completed three straight passes to WR Raymond Berry for 62 yards. A 20 yard field goal by K Steve Myhra sent the game into overtime tied at 17. In overtime, the Colts drove 80 yards in 13 plays. A 12 yard pass from Unitas to Berry brought the ball to the Giants eight yard line. There was a one yard run by RB Alan Ameche to the seven. An incomplete pass on the right sideline,and a six yard pass to TE Jim Mutscheller brought the ball to the one. Alan Ameche scored on the one yard run for the 23-17 OT final. QB John Unitas had thrown the ball three times inside the 10 yard line. There were gambling questions raised, but they were never answered. As Unitas later stated, the players had never heard of overtime before the game. "When the game ended in a tie, we were standing on the sidelines waiting to see what came next. All of a sudden, the officials came over and said, 'Send the captain out. We're going to flip a coin to see who will receive.' That was the first we heard of the overtime period." 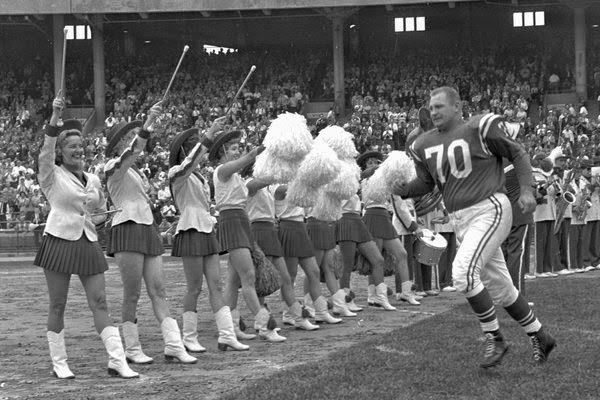 The first player from the Colts inducted into the Pro Football Hall of Fame was DT Art Donovan Jr. in 1968. Art was the son of the famous boxing referee who officiated at twenty Joe Louis fights, including both Max Schmeling bouts. Art Jr. attended Mount Saint Michael Academy in the Bronx. He received a scholarship to the University of Notre Dame in 1942 but left after one semester to join the United States Marine Corps, where he spent four years during World War II. He was stationed in the Pacific Theatre and took part in some of the conflict's fiercest engagements, such as the Battle of Luzon and the Battle of Iwo Jima. His earned citations, which included the Asiatic-Pacific Campaign Medal and the Philippine Liberation Medal, and would later earn him a place in the U.S. Marine Corps Sports Hall of Fame, the first pro football player so honored. After the war, he completed his college career at Boston College. Donovan would appear on the David Letterman Show 10 times. Art told stories about playing football without a helmet, and playing in a game with a broken leg and having to lay down on each play so the opponent had nobody to block. He promoted his book, Fatso: Football When Men Were Really Men. Letterman wore Donovan's No. 70 Colts retired jersey in the famous Super Bowl XLI commercial with Oprah Winfrey and Jay Leno.